Sure, you love your dog. But that frequent, noisy barking? Not so much. That’s why Garmin developed BarkLimiter 2. This bark correction device uses accelerometer-based bark identification to distinguish between repetitive barking and other sounds. 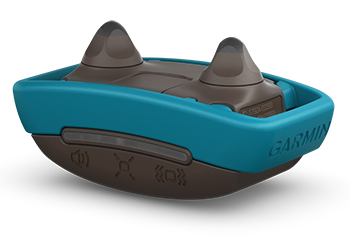 Then it corrects bad barking behavior with on-collar tone and vibration or 10 safe stim levels. The slim, lightweight BarkLimiter 2 device attaches comfortably to your dog’s collar and senses throat vibrations to virtually eliminate false corrections from external noises such as the barking of other dogs nearby. The unit’s selectable long or short plastic contact points adapt the device to work on all dog breeds and coat thicknesses. Plus, the rechargeable lithium-ion battery keeps the power coming — and the on-collar corrections working — for weeks at a time. As the responsible pet parent in your family, you want to modify your dog’s bad barking behavior without overcorrecting. BarkLimiter 2 offers advanced Autorise technology to optimize the corrections your dog receives. Autorise starts at the lowest correction level and gradually adjusts to a level to stop unwanted barking without rising further. This gives you immediate relief from nuisance barking. Right out of the box, BarkLimiter 2 lets you select tone, vibration or gentle Autorise stim corrections — so you can quickly and easily choose the prompts that work most effectively for your dog. For your own visual reference, a status LED light on the device indicates battery life, bark detection and correction. For even more capability, BarkLimiter 2 works with the free Garmin Canine app on your compatible smartphone or tablet². Use the app to set up your BarkLimiter 2 device and enable your phone or tablet to serve as a wireless handheld component for your system. The app lets you remotely adjust settings and select automatic or manual stim levels. Plus, you can also review bark history data to see what times of day your dog tends to trigger corrections.